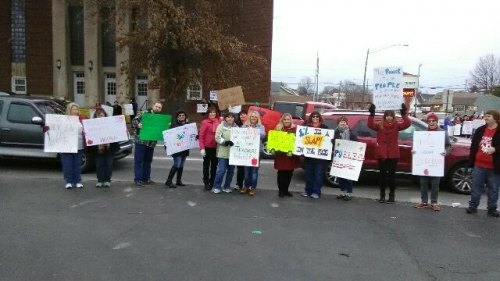 Cabell County school employees took to Fifth Avenue and 29th Street across from the Board of Education office to picket Saturday, Feb. 3, concerning the legislative offer of a 1% per year raise for which the cost of PEIA health insurance more than offsets. Employees from three counties had left their education jobs Friday, Feb. 2 to lobby the legislature. Kanawha County employees staged a protest prior to the start o the school day.